.002 .004 OOB .008 .010 TIME (SEC.) Figure 17. Bolt Velocity Versus Time in a Plain Blowback Gun. a few feet per second. Furthermore, from the shape of the curve in fig. 1-7, it can be seen that even the maximum bolt velocity attained will not be much greater than this value. The second important point is that with such a low bolt velocity allowable, a high-powered plain blowback machine gun could never attain a reasonable rate of fire. To illustrate this point, the bolt of a 20-mm gun must open about. 10 inches in order to permit feeding. Thus, in opening and closing, it. must travel a total distance of nearly two feet per cycle, and if it. does this at ari average velocity of about two feet per second, the firing rate will be the ridiculously low figure of approximately 50 or 60 rounds per minute. 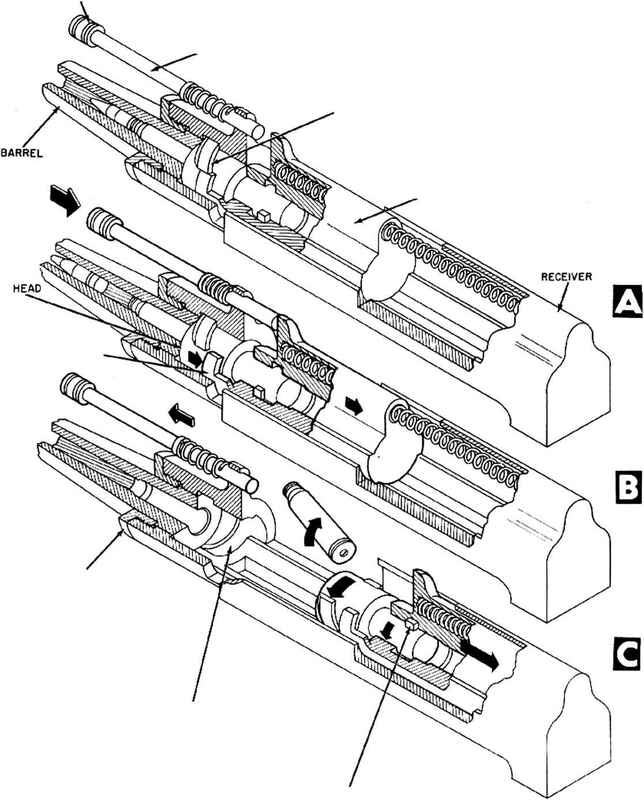 There are other difficulties encountered with a high-powered plain blowback gun and, in fact, these difficulties are so serious that it is difficult to make such a gun function as an automatic weapon. These difficulties are examined further in the following paragraphs. It might seem that such an analysis would amount to an unnecessary preoccupation with an impractical system. However, although this analysis deals with exaggerated conditions, it is made intentionally to disclose and highlight the fundamental concepts involved in the blowback principle and to provide a basis for understanding the other forms of blowback.